Joshua Comes In Heavy, Takam Comes In Light – Could It Be A Factor? 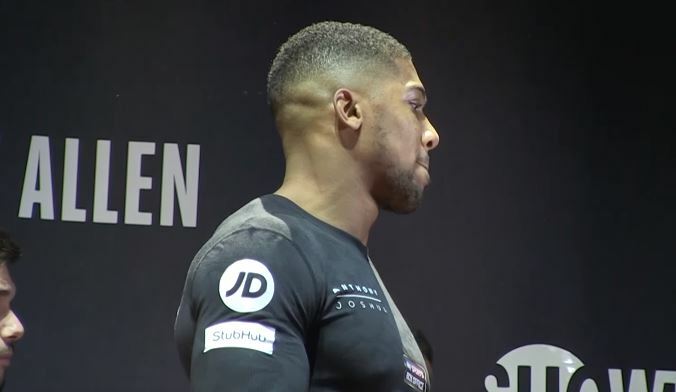 Anthony Joshua comes in heavy for his weigh in ahead of Carlos Takam fight. His opponent on the contrary came in light. Anthony Joshua came in at his heaviest ever as a professional today ahead of his fight with Carlos Takam tomorrow night. 18 stone 2lbs was the official weight. It’s hard to tell if that is any reflection on how he trained for the fight, though. The man himself said he feels much fitter than ever before so potentially it could just be a case of him filling out. Heavyweights do tend to develop later in their career physically if you look over the history of boxing. Joshua at age 28 is still relatively very young as a heavyweight. His opponent Takam on the other hand came in lighter than he usually does. 16 stone 11lbs. Despite being a late replacement Takam had been in training for a fight anyway these past couple of months and it showed. The main question really will be what happens if Joshua goes for the kill early and doesn’t get him out of there? In the Wladimir Klitschko fight Joshua did run out of gas at one point by the end of round 5. Only to get a second wind later in the fight after taking some rounds off. Takam and Klitschko are obviously two different kettle of fishes, granted, but Takam will know that if he weathers an early storm that all the added weight on Joshua could drain his stamina as the bout goes on.